Members of Rainbow Umbrella of Central Vermont, an LGBT community group, as well as the Unitarian Church of Montpelier held a rally Friday to raise awareness for transgender issues. A report issued earlier this month by the Human Rights Commission and the Trans People of Color Coalition said at least 21 transgender people had been killed in the U.S. so far in 2015. In Vermont, however, transgender women and a gender fluid student at the Montpelier rally said they generally feel safe and respected in their community. 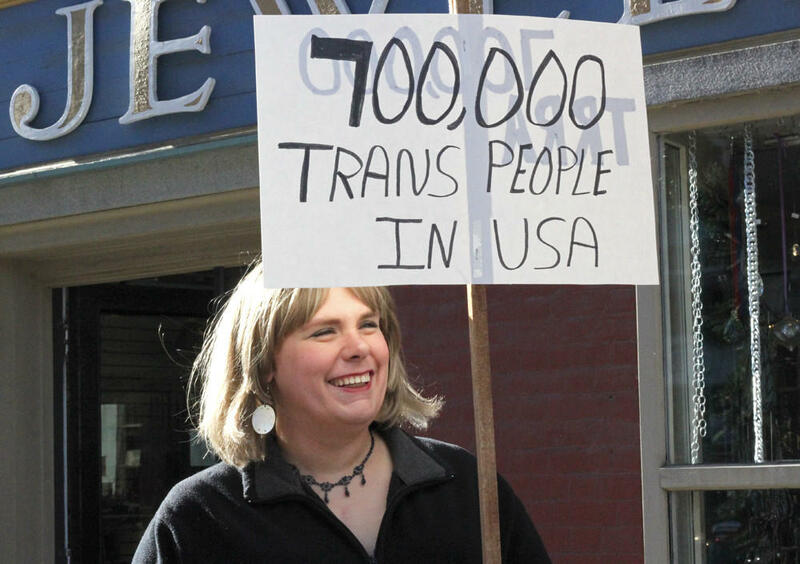 Erica Bosserman stood along Main Street in downtown Montpelier holding a sign highlighting the fact that more than 1,700 trans people have been killed worldwide since 2008. Erica Bosserman was among more than two dozen Vermonters at a rally to raise awareness for transgender issues in Montpelier. Bosserman on the range of experiences she's had coming out over the course of her life. Naomi DeGroot, a student at Montpelier High School, is gender fluid and recently started using they/them pronouns. They said Vermonters tend to be very accepting. "We're all white cis[gender] people here," DeGroot said of Vermont's demographics. "Whenever people see something different, they think, 'Oh my God, this is great! We have diversity here,' and I think that's really cool." Degroot on the fluid nature of gender. Rachel Young came to the rally from Worcester. She said that her experience in Vermont has, for the most part, been one of respect and acceptance. Rachel Young says central Vermont has been very accepting, even during awkward stages of her transition. Young on the reactions she gets to some of the more awkward changes that can come with transitioning. Friday's rally was co-sponsored by the Unitarian Church of Montpelier and Rainbow Umbrella of Central Vermont, an LGBT community group founded in the spring. 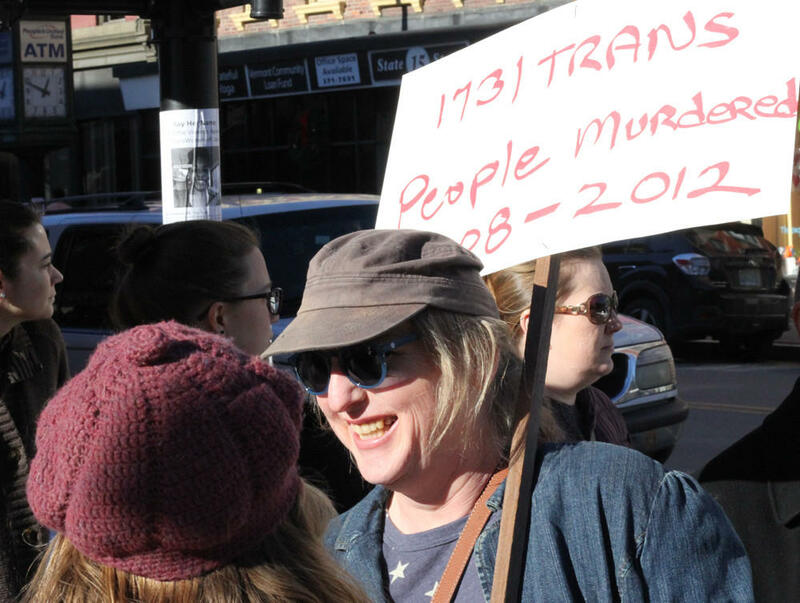 With the public event, participants said they hoped to raise awareness for the persecution trans people face nationally and internationally and also to continue to make Vermont a safe place for people of all gender identities. While Bosserman values the safety and acceptance she's experienced, she says it's not always the case for other trans individuals around the country. As DeGroot said, gender is "different for each individual person." What is your relationship with gender identity? How has that shaped your experience as a Vermonter? Share your experiences below or email us at share@vpr.net. When asked to choose a metaphor to describe the salary negotiation process, women pick "going to the dentist." Most men choose "winning a ballgame." In Vermont, women still make on average 87 percent of what their male colleagues do. Perhaps that’s partly because they’re not asking for more? We’ll talk to Cheryl Hanna, Vermont Law School Professor, and Cary Brown, executive director of The Vermont Commission on Women, about pay equity and what women can do to be better negotiators.